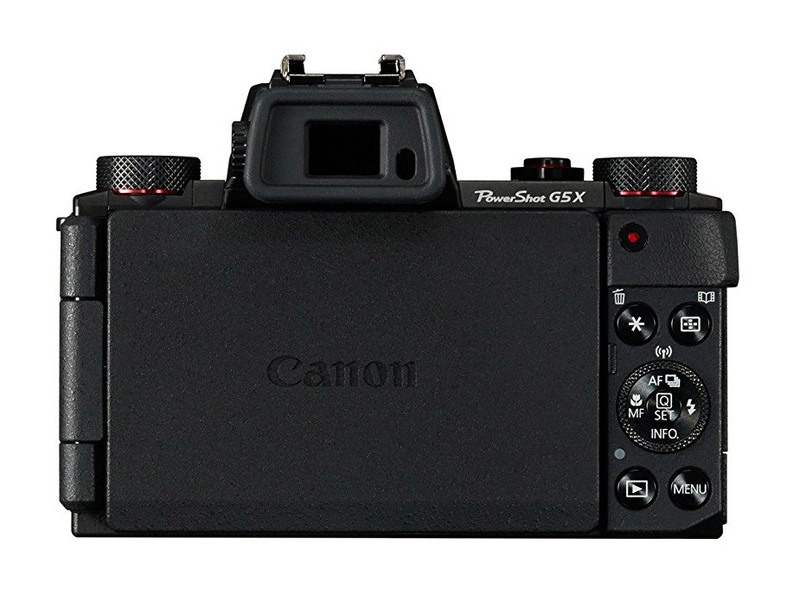 The PowerShot G5 X was introduced by Canon in September 2015. It belongs to the enthusiast Compacts category. Canon is well-known and shouldn't require further introduction, please see our manufacturer's page for more digital cameras by Canon. 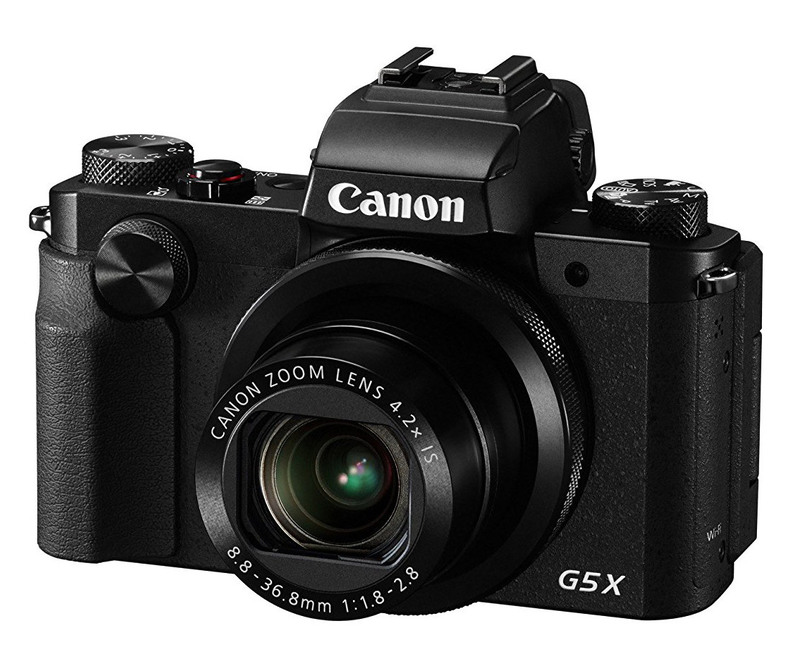 The PowerShot G5 X features a CMOS sensor in 1" size that has an area of approximately 13 x 9 mm² (0.52" x 0.35"). The PowerShot G5 X's image sensor has an effective resolution of around 20 megapixel. The resolution is above average and will be sufficient for the foreseeable future. 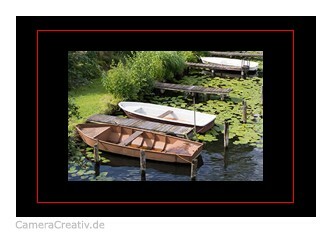 Photos with this resolution can easily be printed in A2 size or larger, even if unwanted parts of the photo have to be cropped. The Canon supports taking images in RAW. RAW images are stored as they come from the sensor, without any in-camera processing or sharpening. Converting to JPEG or other formats takes place on the computer, using software like Adobe Lightroom or Canon's RAW converter. This involves one extra processing step but almost always results in superior image quality. Some filters, like converting to monochrome (black and white) will only yield decent results when used with RAW images. The PowerShot G5 X has a built-in lens that can not be changed. The Canon's focal length goes from 24mm to 100mm, a zoom range of 4x. The aperture varies from F1.8 at the short or wide-angle end, to F2.8. The PowerShot G5 X uses an electronic viewfinder with a resolution of 2.36 megapixel, an excellent value for a viewfinder like this which makes the camera a joy to use. 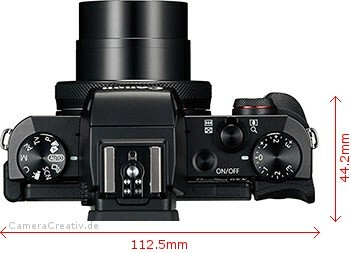 The magnifcation is c. 0.65x, an above average value for an electronic viewfinder. 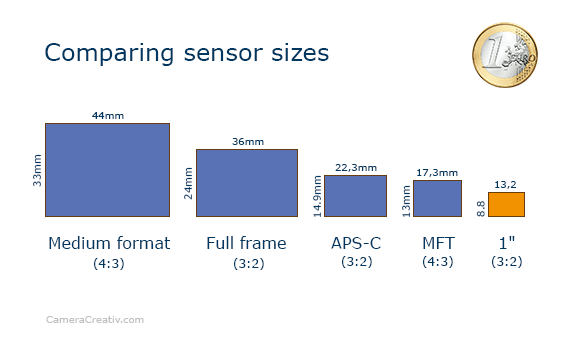 The infographic illustrates the viewfinder magnification of the PowerShot G5 X. The black area represents a magnification of 1x, corresponding to natural size. The red frame indicates the largest viewfinder magnification in any digital camera on the market today (0.85x). Tip: If the viewfinder image of the PowerShot G5 X is fuzzy, us the little wheel next to the viewfinder to adjust the sharpness. The PowerShot G5 X's shutter speeds range from 1/2000s to 30s. The highest shutter speed of the Canon is just 1/2000s. That's no longer state of the art and may cause problems in challenging light conditions. The PowerShot G5 X's sensitivity goes from 125 ISO und 12800 ISO, a very useful and practical range. 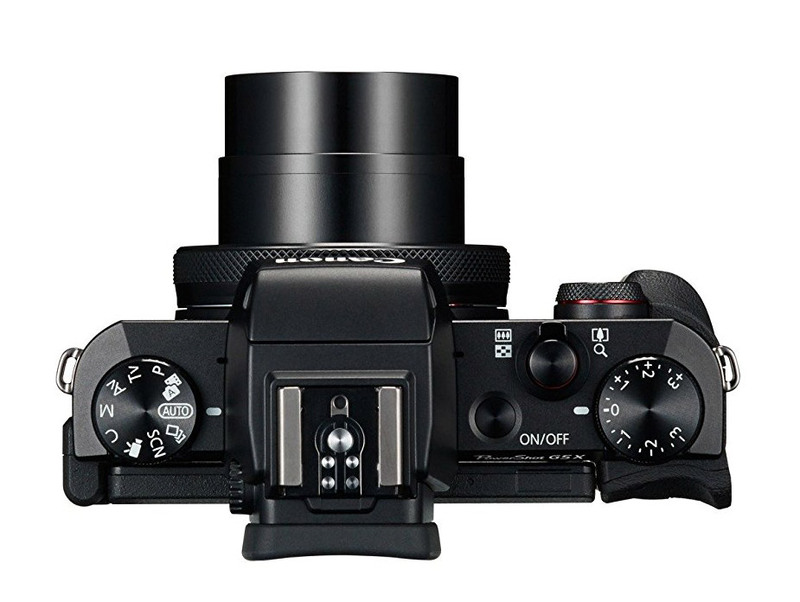 The PowerShot G5 X supports all common metering modes. The Canon will also allow spot metering, a must for challenging motives. The PowerShot G5 X's auto focus processor uses 31 AF points (or sensors). A basic rule of thumb says that the more AF points you have, the better. More AF points mean a better chance to have a point at the location of interest in a scene, a big plus in challenging situations (e.g. with low contrast subjects). Manual focus is also possible with the Canon, a plus in tricky situations or for some creative freedom. The PowerShot G5 X features a built-in flash with a range of up to 7m (23 ft.). That range will work for most situations. A flash or a trigger for remote flashes can be attached to the Canon's hotshoe. Very useful for indirect flashes or for trigggering remote flashes. The PowerShot G5 X features a monitor with a diagonal of 75.00mm (3.0 in.) and a resolution of c. 1.04 megapixel. That's about average. The camera's display is articulated, a plus for selfies and other challenging situations. The PowerShot G5 X's monitor can work as a touch screen, just like a smartphone. That can be very useful, for example to pick AF points, but keep in mind that touch screens usually don't work when wearing gloves. When recording videos with the PowerShot G5 X, the highest supported resolution is 1920 x 1080 pixel, in other words Full HD Video. 4K videos are not supported by the Canon. A connector for an external microphone is missing from the Canon. A built-in mike will usually record everything in front and to the sides of the camera which is not always what the film maker wants. Internal microphones also tend to record camera sounds like focus beeps. The PowerShot G5 X has Wifi connectivity already built-in. Use Wifi to transfer images to a smartphone or computer and to remote control the camera. With NFC, camera and smartphone can be paired without the need for passwords. Connect the Canon to a monitor or TV set over HDMI. The Canon connects to your PC over USB 2.0. 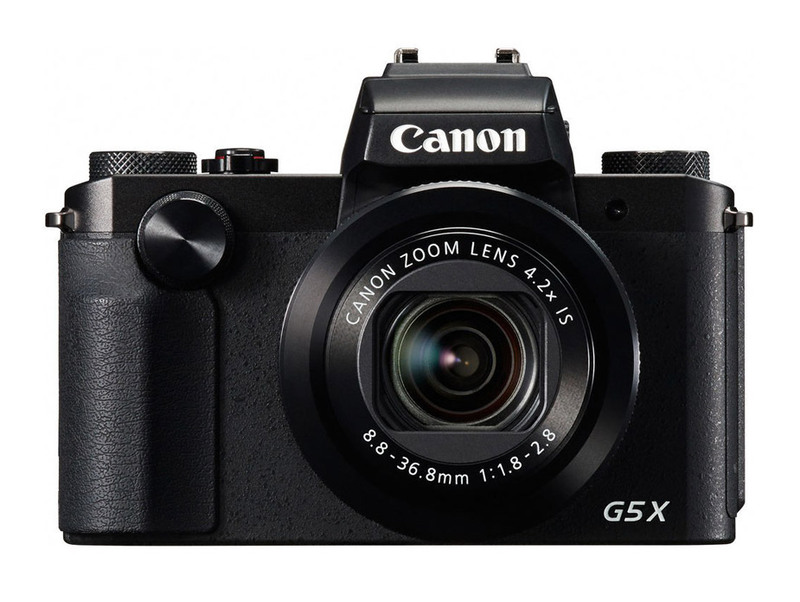 What memory cards can be used with the Canon PowerShot G5 X? The camera will accept all common SD HC and SD XC cards. With an average image size of 8 megabytes (JPEG, fine) a 32 GByte memory card would hold up to 4000 images. The PowerShot G5 X doesn't have a built-in GPS receiver. If you want to add coordinates to your photos, you'll have to do so in 3rd party software like Adobe Lightroom. However, with Wifi built-in, location data can also be added via a connected smartphone. The PowerShot G5 X features a built-in stabilizer. With a 4x zoom a good thing to have. The camera can create HDRs automatically. That saves you from manually creating sequences of images with variying exposure values. The PowerShot G5 X is not environmentally sealed against dust and moisture; keep that in mind in the rain and on the beach. The Canon PowerShot G5 X works with a NB-13L LiIon battery. The battery lifetime is an average 210 shots. That's on the lower side of things for a full day, consider a spare battery for the PowerShot G5 X. The battery can be charged over USB while in camera. Very useful, especially on vacation when most people bring a USB charger for their smartphone anyway. 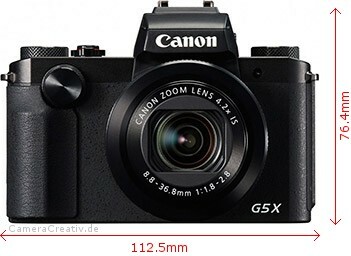 The Canon PowerShot G5 X's dimensions are 112.5 x 76.4 x 44.2mm³. (4.4" x 3.0" x 1.7"). This includes the lens. The camera's weight is a reasonable 377 grams (12.2 oz. ), lens included. To put the size of the camera in context, here it is next to a typical ID card (c. 86mm x 55mm, about the size of a credit card). Source of specifications and product images: Manufacturer. This page was generated by an experimental computer program. Errors and omissions excepted. Info graphics and camera rating © 2017-19 CameraCreativ.com. All rights reserved.